The earliest recorded street-lights, known as cressets, took the form of decorative iron baskets which were fixed on to the walls of some Italian palaces. Light came from coils of rope soaked in pitch which were placed in the cressets and lit. Such lanterns were almost exclusively confined to Italy. Throughout Italy for many centuries street lighting was provided by the individual citizen, sometimes impelled by law. It was not until the eighteenth century that any European city was regularly lit. Wrought iron cresset. 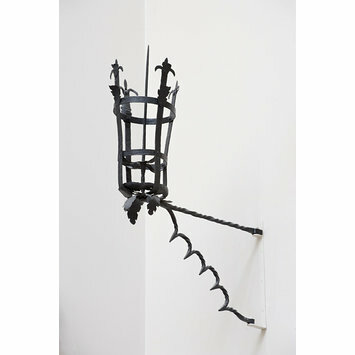 A spiraling stem and twisting iron bracket support the basket. The basket is constructed of a base, two bands and four side supports which terminate in fleur-de-lis. 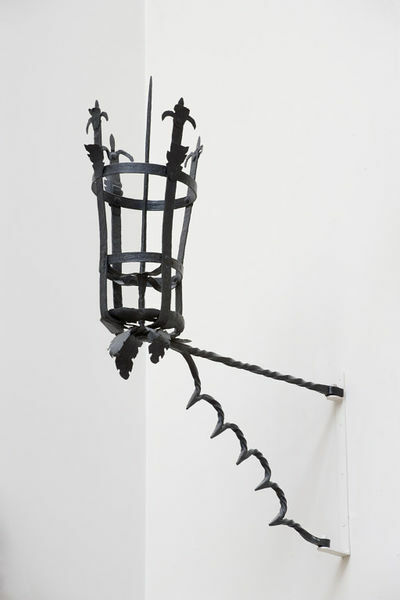 The earliest recorded street-lights, known as cressets, took the form of decorative iron baskets which were fixed on to the walls of some Italian palaces. Such lanterns were almost exclusively confined to Italy. The Victoria and Albert Museum possesses three cressets and others remain in situ in Lucca- on the Bocella and Baroni palaces, at Perugia, Siena and Florence. The best surviving example was made by Nicolò Grosso in 1489 for the Strozzi palace, Florence (where it can still be seen) and, since the nineteenth century, this has been much imitated. Vassari wrote of the palace "To the end that everything might be in keeping, he (Filippo Strozzi) caused beautiful pieces of ironwork to be made for all parts of the palace, as adornments for it, and the lanterns that are at the corners...In those marvellous lanterns may be seen cornices, columns, capitals and brackets of iron, fixed together with wonderful workmanship". Light came from coils of rope soaked in pitch which were placed in the cressets and lit. Nightfall imposed very real curbs upon social activity in Renaissance cities and for many centuries street lighting was provided by the individual citizen, sometimes impelled by law. It was not until the eighteenth century that any European city was regularly lit. Gardner, John Starkie. Ironwork. Part 2: Continental ironwork of the renaissance and later periods. London, 1896. The Art Journal. 1869. p.191. Wall-mounted cressets, an early form of street lighting, seem to have been unique to Italy. It appears that permission to use them was restricted to noble or wealthy citizens. Coils of rope soaked in pitch were placed in cradles and lit by burning torches.